I’ve been terrible with trying to keep up with this quantitative metric, but I figured it wouldn’t hurt to throw out an updated version in a vain attempt to try to play catch up with the status quo, being that the league is crawling towards the World Cup break. Really, the point of this exercise is to try and capture how often players are creating shots–not just for themselves, but for teammates. 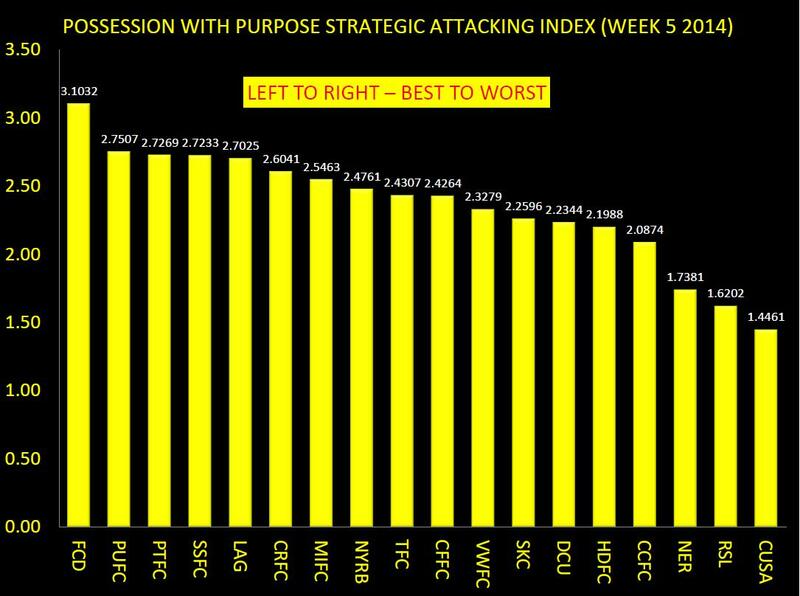 It’s still pretty simplistic, and by no means the definitive answer to who the most valuable attackers are, but it’s a start in moving away from basing value judgements on goal totals. To be as clear as possible this is not a metric that measures quality or success of the shot. It’s purely about opportunities to score. Either by way of putting mates* in position to score through passes that lead to shots–key passes–or to create a shot by himself–assisted or not–are the ways I count shots created. One thing I did do to include the best available and least luck-influenced player was to set a threshold of 700 minutes played. That limit was arbitrary and selected merely based upon the results of compiling the list. For that reason, and no other, you won’t see individuals such as Michael Bradley, Gilberto, Brad Davis, Joao Plata, Marco Di Vaio and Kekuta Manneh on this list even though their shot creation rates merited a position in the top 50. I am very high on both Plata and Manneh, and I would love to see both surpass the 600-minute mark and really fly beyond 2,000 minutes this season so we can see what their stable versions look like. I’ll admit there is quite a bit of disparity between Diego Fagundez (#33) and Nick DeLeon (#49). This group does however hold a few names seems that, to my mind, seem to fit together. Blas Perez (#50), Erick Torres (#45), Jack McInerney (#44) and Andrew Wenger (#34) all are viewed a bit differently in terms of success, but, again, this isn’t about results-based productivity so much as process-based productivity. We’re merely looking at how much they’re involved in creating goal scoring chances, regardless of the quality of those chances or where they are located. In that context it makes more sense. The lone surprise for me in this tier is Justin Mapp. I would have assumed he’d be much higher on this list being that he’s been on the few bright spots for Montreal a long with JackMac. Two other names that are notable here. Edson Buddle (#27)–whom everyone thought was done two years ago when he was traded to Colorado–and Marco Pappa (#16), who was kind of a last minute signing before the start of the season, and who was a serious question mark considering his lack of playing time in the Netherlands. Now both of these individuals that were stamped as likely non-essentials are two of most involved in the creation of their clubs attack. Lee Nguyen (29) coming in higher than Obafemi Martins (31) makes me laugh, simply because Martins is second in the league in assists and most people still hold that to being the truest or, perhaps, the most obvious sign of team goal contributions. Yet Nguyen has been a catalyst for New England and is simply their most valuable player when it comes to finding the ability to create chances. This is the meat and potatoes of the list. So there that is. There shouldn’t be any argument here with any of these names. Fabian Espindola (#8) is the sole reason DC even has a shot at the playoffs. He is going to get every opportunity to be ‘the man’ in black and red. Landon Donovan (#6) despite his uncanny snubbery from the US National Team is still clearly a major factor for the Galaxy and their attack. Sticking with the theme of decline in skills, Thierry Henry (#5) is still one of the greatest to ever play in MLS. Oh, and I’m just biding my time for Higuian to get past this “slump” and jet into the MVP Candidate category… because that’s simply where he belongs. More on that down the road. Clint Dempsey (#2) has had the kind of year that is simply bananas. It’s been so crazy that it’s somehow eclipsed the Pedro Morales (#1) show that is going on just a few short hours north of him. Sure, these guys take penalty kicks, but that’s only a small fraction of their shots generated. If these two take this same show into the later stages of the season I can’t think there would be much reason to consider anyone else for MVP. Oh, I guess you could probably throw Robbie Keane‘s (#3) name in that list, too. People forget about ol’ faithful, but even without his P.I.C. (read: ‘Partner in Crime’ for those that aren’t as hip as I am) for a game or two here and there, he’s still been incredible. Currently he ranks third in individual expected goals, proving that he also finds dangerous places to take his shots and doesn’t hesitate to pull the trigger. Oh, and despite the angry looks and words AND finger wags, he gets his teammates those same opportunities. And here’s the Excel File for the top 50. Okay, shots. We talk a lot about shots because, well, shots lead to goals. Obviously you can’t have a goal without first attempting a shot. I know that was a deep thought, but just go with me here. We put a lot of emphasis on shots here and have dug into their expectation leading to goals. It’s backed by the belief that shots are important statistics in correlation to team success. Now there are plenty of caveats to shots and we use them to influence our ideas of what is good or bad. Matthias has taken time to explain at least some of them. So with all that said you can’t read too much into all of these numbers. Take for instance the fact that Frederico Higuian creates 7.03 shots per 90 minutes. That’s nearly a shot and a quarter more than Brad Davis at 5.79. Is Higuian a better shot creator because he creates one additional shot over the course of a single match? If that shot is from zone 4 or even 5, the value of that single shot becomes marginalized in that specific instance. Despite all of those various acknowledgements of how this is marginally interesting, and yet mostly a useless exercise, I put together a follow-up of last week’s top 50 individual shots creators in Major League Soccer. I decided it was best to cut up this data and present it via a tiered system to make it a bit more palatable and to highlight the players that have set themselves apart from their peers. Also, this allows me to be a bit creative in the tier process. Oh, yeah… Marco Di Viao. He’s also pretty good at this whole soccer thing. I guess we can all say that we could have guessed every singl–what the hell is Pedro Morales doing in there??? I guess that probably explains a lot about what’s been happening in Vancouver. He’s second overall in total Shots Created and he could very well be a shoo-in for MLS Newcomer of the Year. He’s like the offensive equivalent of what Jose Goncalves was last year to New England. I only have one question: who is this Camilo guy everyone was talking about? Justin Mapp has the same amount of total Shots Created as Mauro Diaz in almost 20 minutes less field time. Try thinking about that next time you’re frustrated by Mapp’s hair line. Try. Speaking of Sam, I added him to my MLS Fantasy Roster for tonight, hedging the bet that he finally scores a goal. At last look, the guy currently holds the highest xGoal predictor score without actually scoring a goal. If there was ever a guy that was “due” to score a goal, it’s him and I’m virtually betting on it happening. On the note of not scoring goals, “Hi, Landon Donovan“. Who, in case you didn’t notice, is still a good player even when not putting the ball in the back of the net. Because, you know, skillz. There are roughly 19 names here and I’m not going to go through them all. But key surprises are Jack McInerney, who everyone continues to think is “slumping” when he’s not scoring goals. Baggio Husidic is making waves in that flashy new diamond attack in LA. Husidic is filling the hole that once upon a time existed out wide and makes the Robbie Rogers-trade look worse and worse, as he likely won’t make it past a bench position upon return. Bernardo Anor has been doing a lot for Columbus out of the midfield but, perhaps, the bigger story than Anor–or even the LA trade for Rogers–is that fact that Gregg Berhalter pretty much stole Hector Jimenez who is looking brilliant in his new Crew colors. Teal Bunbury is finally being “the other guy” and taking shots in New England. Lord knows they need to start converting those opportunities. Sal Zizzo wasn’t exactly a headline move this off-season, but since being let go by Portland this past off-season he’s been a gold staple in the Sporting KC line-up. Kenny Cooper is having himself a quietly productive first season in the Emerald City. Yes, it’s towards the bottom of the line-up and it doesn’t really mean much of anything. But he’s been reliable and fits in with Clint Dempsey and Oba Martins, playing the third/fourth fiddle and doing whatever needs to happen. Great role for him and he’s doing it well. There are a lot of things to take away from this. Like why didn’t I just make two tiers: IBC Rootbeer and Barqs, which is basically all you’re going to go with unless there is some local brewed Root beer that you want to try for funsies. Anyways, some information here. Not necessarily good information, but at this stage of analysis and data when it comes to MLS, and really soccer in general, what is “good” information? And so it goes; another week completed where you got the heart-pounding excitement from the Cascadia Cup clash, a defensive struggle from two of the best teams in MLS, and lopsided victories for two others. Before digging in, a couple of links to consider: if you missed the match between Portland and Seattle here are two articles you may want to read if the opportunity presents itself. This one was offered up by MLS, and then here’s mine offered up on my home site here in Portland with the Columbian Newspaper. Also, if PWP is new for you there may be value in reading what that’s about through this link, an introduction to PWP and some explanations in case this approach is new to you. With that out of the way it’s time for some grist… who was the most effective and efficient team in my PWP Composite Index this week, and who was the worst? To set the table here’s my standard diagram for Week 5 only. Later this week I will publish the Cumulative Index – when I do I’ll pop that link here. There were two games this past weekend with lopsided scores (3-nil LA over Chivas) and (4-1 FC Dallas over Houston). Up until the completion of the LA Galaxy 3-nil thrashing of Chivas USA, it looked like FC Dallas would be top of the heap for Week 5 – and rightly so given they put 3 past Houston plus they got the Orange team to give them an own goal as well. But as you can see, LA were tops this week; more later on why, and it may surprise you. The tough part about the FC Dallas game, for Houston, was the straight red and sending off of David Horst on what the Referee considered was a rash foul down Houston’s right sideline. I’m not so sure about that but as we have seen so far this year, the Referee’s are stamping their authority with no reservation whatsoever. Spilt milk and, as it goes. Dallas scored three goals within 15 minutes of that Red Card to take three points. If you run a team defense in Fantasy football and have Houston in that role you got hosed – I do and I got hosed in the back-four; still got 52 points though! If anyone wasn’t sure about how Landon Donovan could operate in a Diamond 4-4-2, be advised that he can – he has – and he will; when surrounded by other strong players, he’s tough to stop. For me, though, this game wasn’t about just scoring goals. 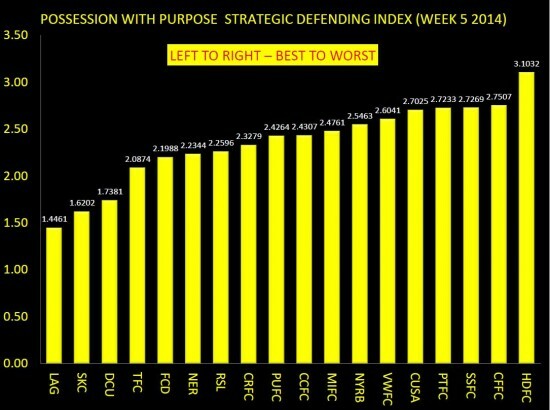 It was also about defense, and it’s that defensive mindset that put LA at the overall top this week – clean sheets matter! If it’s LA shutting down Chivas that garners the top offensive spot, then it’s reasonable the flip side is the complete lack of structure and focus from Chivas that sees them at the bottom. Carlos Bocanegra has great mental awareness, but he can’t stop an aggressive Galaxy attack on his own – and in the short glimpses I had of their video it certainly looked to me like Baptiste and others were simply outmatched. As for Houston – enuf said – the Red Card to Horst directly influenced the outcome of that game. As for the middle of the middle of the pack… if you read my recommendations above about the Timbers-Sounders match, you know that game was all about possession with the intent to penetrate. There was absolutely no possession, that I saw, where the intent was to possess just for the sake of controlling possession. There is no love lost between those two teams, and it seems every time they meet both just simply want to smash each other senseless. It makes for great entertainment, but there are times in my book where negative football has value, and securing three points (like it or not) is a time where negative football has value. For the first time this year the magical 3.00 barrier was broken in the attacking index. It comes on the heels of the USMNT also breaking the 3.00 barrier in the first half against Mexico. If you missed my thoughts on that game, you can review them here. Onwards and upwards – for the first time this year Portland broke the top-five barrier in team attack for a given week, getting two stunners from Diego Chara plus another couple from the Argentina contingent of Diego Valeri and Maxi Urruti. Not to be outdone was the final 20-minute performance of Clint Dempsey – aye – he got a goal early on, but for much of the game his influence and presence was pretty much unnoticed. Indeed, the chalkboard tells us that between about the 40-minute mark and the 70-minute mark, he had just 9 touches of any sort with no shots or key passes. It wasn’t until the 70-minute mark where he started to directly influence and impact the game. After that point, Dempsey had no fewer than 18 touches in the run of play with one key pass, three shots on target, and a goal. I’m all for highlighting his hat trick in that game, but he simply wasn’t solid through the full 90+ minutes, and his team barely eked out a draw. That may be a surprise to some on two fronts. One – Dempsey got a Hat Trick. And Two – what about Watson or Diaz? Well, as already noted, Dempsey simply didn’t play well for a full 90+ minutes and his presence and influence did not prevent Portland from having their best attacking performance of the year. In addition, it’s likely Seattle drops three points if Ben Zemanski doesn’t do what he did in the box, and I’m simply not in favor of seeing someone getting an Attacking Player of the Week award when his team loses or draws. 3 points is the objective in this game – it’s not all about just scoring goals. 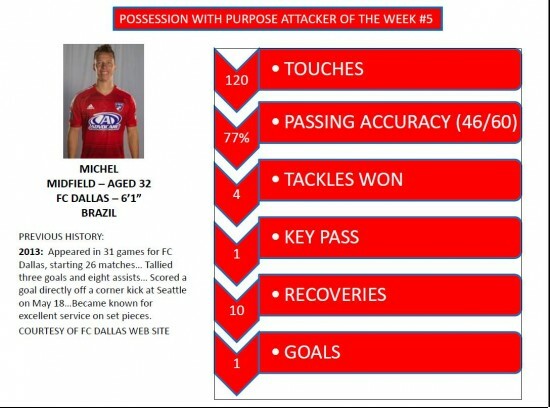 And two – while Diaz is the spark that lights the Dallas attack this year and Watson donated a brace of goals this weekend, I feel and think Michel had more overall responsibility on the pitch; therefore – given his vast number of touches on both sides of the ball I give him the award. And in case you missed it, I don’t view this weekly award as going to someone who just lights up the front end without also considering how well they supported the back end. It was a close call between LA and Sporting KC this week when it came down to it; any team who can get a clean sheet against Real Salt Lake has really done their job. But… alas… the Top PWP Defending team was LA. Why? Well it really came down to how poorly Chivas USA performed against LA, and not how poorly Real Salt Lake performed against Sporting; remember – this Weekly Index does not get influenced by previous performances on a week to week basis only the Cumulative Index does. When checking out my Cumulative Index later this week, you may see a change in who the top defending team is overall – for now though – this is just Week 5. In looking at the player statistics I had considered awarding the PWP Defender of Week 5 to Landon Donovan, and here’s why: he had three key passes, five recoveries and an 85% passing accuracy with 2 assists. But the more compelling case fell to Juninho, given his combined efforts (like Michel) playing on both sides of the ball. Week 5 saw some individual players step up and some team performances improve as compared to previous weeks. It’s a long season, and it’s likely the Cumulative Index will continue to take shape – especially after the (unexpected) Toronto victory over Columbus in Ohio. You may have thought that game flew under the radar, but it hasn’t, and Toronto will look the better for it in my Cumulative Index… all is not lost when a team gets a big victory without getting the headlines for that week. If curious – here’s a link to my Weekly PWP analysis on the Red Bulls of New York. Hello friends. This is the first in what will hopefully be a weekly feature here at ASA by yours truly. First, the background: Not being a fan of any particular MLS team is hard. It’s hard to follow an entire league of 19 teams. Seven or eight games a week are difficult to catch up on, even when they aren’t all played at the same time. Previously, I’ve watched highlights and ‘condensed games’ to try to pick up which teams and players were playing well, but it just doesn’t work. The only way to really learn a team’s strengths, weaknesses and tendencies is by watching every minute of every game they play. There’s no way I can do that with every team in MLS while still working a full-time job. Sorry. My solution is this: I plan on committing to watching a full 90 minutes of three games per week. This gives me six teams that I’ll feel that I truly know (at least for that week), and should certainly teach me a heckuva lot more than just if I just watched their highlight packages. Since this here is an analytical and statistic-focused blog, I’ll break down each of the three games by one particular stat or Opta chalkboard image that I think told the story of the game for each team. Think this idea is idiotic? Love it? Please, let me know: feedback is always appreciated. But leave my mom out of this. 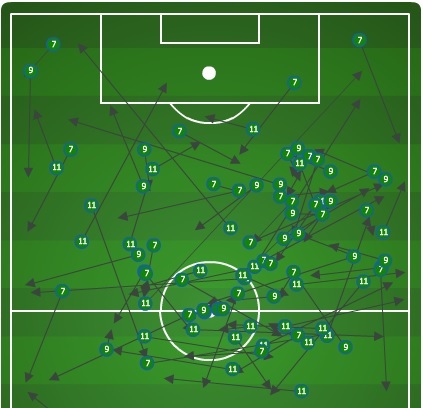 The above image is all of the completed passes for Crew fullbacks Waylon Francis and Josh Williams on Saturday. These two players are clearly defenders who aren’t afraid to get forward, but the startling frequency with which they were able to get up the field against DC had to have alarm bells ringing for United fans. 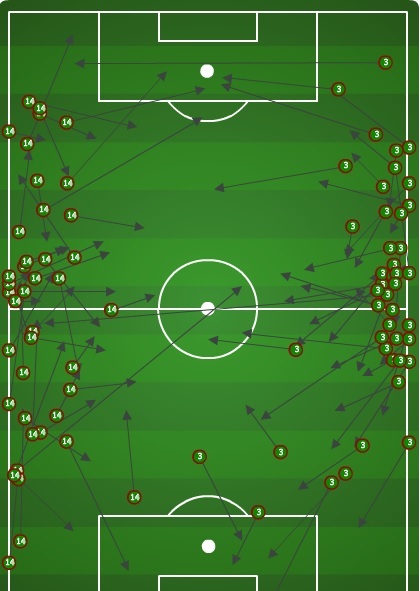 For folks who prefer numbers to images, here you are: 49 of the 85 passes that Francis and Williams completed (58%) were in the attacking half. That’s a pretty solid attacking contribution from two guys who are listed along the back line. This was made possible for Columbus by a couple of adjustments made by new coach Gregg Berhalter. Centerbacks Michael Parkhurst and Giancarlo Gonzalez split reallllly wide when in possession, allowing both fullbacks to get forward. This was made possible by holding midfielder Wil Trapp, who sat very deep to cover the gap between centerbacks. It’s only one game, but it certainly looked like a good strategy in week one for Columbus. Really, the above image for Columbus tells a lot of the story for DC, as well: they got hammered because the Crew got the ball wide and stretched DC’s shape like a bad hamstring. With a team full of new faces who clearly haven’t learned to play with one another yet, the defense was abused by all the space Crew players were able to find. But I can’t use the same stat for both teams, so here’s what I got for United: one. One successful pass from any of the three players nominally deployed in attack (Eddie Johnson, Fabian Espindola, Luis Silva) that ended in the penalty box. Seriously: take a look at the Opta Chalkboard above. I get that it’s hard to complete passes in the 18, but for the three guys who are tasked with creating chances, there needs to be more than one completed pass that ends up there. Oh, and that one completed pass? It came from a free kick, and ended with a flick-on by Davy Arnaud that didn’t even turn into a shot. There was a lot wrong with DC in 2013 and a lot wrong with DC last weekend, but if the new faces of Johnson and Espindola were expected to cure all attacking ills….Ben Olsen may be in for a rude awakening. The Timbers came out for the season opener and were dealt a dose of their own medicine from the new-look Philadelphia Union. Playing in a 4-3-3, the Union clogged the center of the field, put a lot of pressure on Portland and really made it difficult for the home team to get into their possession game. But as any good team does, the Timbers made adjustments. After being credited with just two crosses from open play in the games first 35 minutes, Portland emphasized wide play with Michael Harrington getting forward and Darlington Nagbe flaring out wide. After the 35th minute, Opta credited Portland with 20 crosses from open play. 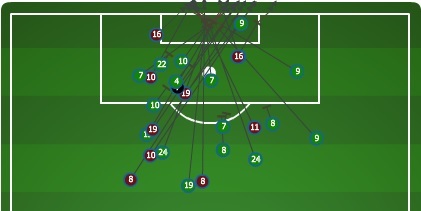 Some of this was due to bombing the ball forward as they sought an equalizer late, but recording 10 times as many crosses was certainly the product of an adjustment made by the Timbers. As I said above, the Union started the game very strong, with their midfield really clogging up Portland’s attempts to possess the ball. The midfield three of Maurice Edu, Brian Carroll and Vincent Nogueira seemed to be replicating some of what made Portland so successful in 2013: clogging the middle of the field and winning a majority of loose balls. Opta credits those three with 12 combined interceptions and recoveries in the game’s first 22 minutes. However, as also noted above, Portland adjusted to the Union’s set-up and began to emphasize wide play. The Union didn’t really adjust to the adjustment, as the Timbers clearly became more and more comfortable as the game went on. After those 12 interceptions/recoveries in the first 22 minutes, Edu, Carroll and Nogueria only recorded seven more the rest of the game. If you’re at this site, chances are you know the concept behind expected goals. If not, scroll down a ways and read up. Anyway, look at the above image: that’s not a map of shots that typically leads to a shutout. According to the numbers run by ASA’s own Harrison Crow, a league average team would’ve finished 2.39 goals from those shots. They finished zero. If you aren’t into the stats and would prefer the English commentator’s version: Robbie Keane missed some sitters, Landon Donovan was unlucky not to finish any of his half-chances, and Juninho and Marcelo Sarvas combined for some speculative efforts that nearly bulged the ol’ onion bag. Oh, and Nick Rimando had a magisterial day in net to keep his clean sheet. I’m cheating a little here because that’s not a real stat, but any time there’s a 1-0 game, it’s tough to leave out any conversation about the lone goal scorer. In this case, that’s the diminutive Ecuadorian, Joao Plata. Plata debuted for Toronto FC three seasons ago, and it seems like he’s been around for a lot longer than your average 22-year-old. But it’s true. Plata is only 22, and if Saturday night is any indication, he could be in for his best season in MLS yet. Not only was Plata’s finish on the game’s only goal very cool, he was consistently playing with a lot more tactical awareness than I’ve seen out of him in the past. Whether it was setting up Alvaro Saborio for golden chances or making intelligent runs to stretch the defense and open up space for Javier Morales, Plata had a very, very good game against LA. I’m not going to lie. The 2013 LA Galaxy we’re pretty much boring. Typically one of the top goal scoring clubs, their ability to squash shots before they happen was as important last year as the offensive heroics. 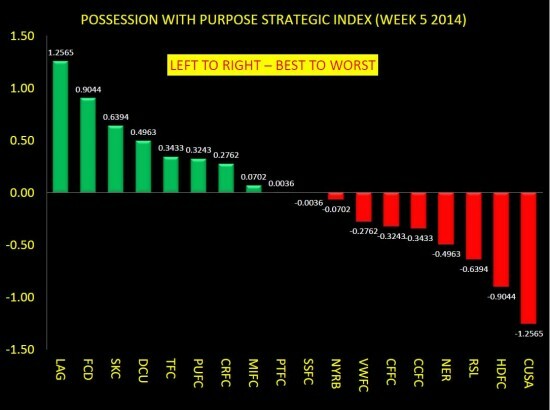 However, it’s foreseeable that the goals against total should have been low, and will be again in 2014. Not only did LA limit the shot totals, they also did a heckuva job limiting the positions in which their opponents were firing those shots. The Galaxy finished second behind Sporting Kansas City in expected goals allowed last season. Unfortunately, for most of the year it was Carlo Cudicini who seemingly made mistake after mistake that led to inopportune goals and limited the point total. Sure, it’s a convenient narrative to put it all on one person, but blaming the Galaxy’s slow starts has merit, and consider the fact that the club played an excess of 48 regular season, post-season, US Open Cup, Champions League and other games during the season (most in MLS). It led to a busy nine months, and very likely thinned the club that already was reduced to bare bones at times. Fast forward to this off-season; big names have often become synonymous with L.A., as the they have been the team that sets the bar when it comes to spending money and acquiring talent…well until Tim Leiweke moved to Toronto last summer. Leiweke, who masterminded David Beckham to the states was the engineer behind Jermain Defoe to Canada this off-season. While Toronto became the big spenders this off-season, L.A. was forced to stand pat with all three of the designated players slots being filled and little available “extra” cash. That may have seemed to bother some people, but not Bruce Arena. Arena took advantage of the off-season to deepen his bench with veterans, raw youth talent and an unknown from Brazil. Omar Gonzalez, whether you find him overrated or not, is the anchor to this defensive line. Despite the fact that there are still some holes to be filled, especially with the loss of Sean Franklin, the Galaxy took a huge step forward in reinforcing the defense with the discovery of Jaime Penedo last year. Gonzalez will obviously miss some time with the US National team at the World Cup, so the big questions going forward are whether or not the club can manage the permanent loss of Franklin, and the temporary drop in talent from Gonzalez to whomever else wins that job in roughly the next 88 days. Not that anyone is counting. Even when Gonzo is around, the right outside fullback positions is still an apparent weaknesses, and considering they don’t have much depth on the wings going forward, it would appear width could be an issue throughout the roster. I fully expect Todd Dunivant to continue his reign as an unspoken and underappreciated left back in this league. Bruce Arena was quoted as saying that Landon Donovan will drop into the midfield and, conjecture on my behalf, probably take over the role of Hector Jimenez who has since been traded to Columbus. While this can provide some width, I suspect that he’ll almost be seen as a third forward at times as he does get up the pitch and like to cut into the box on runs. Despite being 32, he may still be the top-scoring midfielder in MLS. The club does still have Robbie Rogers, but unfortunately his return to MLS has been rather disappointing, and he’s been nowhere near the quality of Mike Magee, for whom he was traded last season. The new international Baggio Husidić returns to MLS from the Swedish second division club Hammarby IF. A former cog in the 2009, 2010 and 2011 Chicago Fire, and a former Generation Adidas midfielder, Husidić is the hope behind the two top central midfield pair in MLS. The blues aren’t just about the glitz and the flash, as additions over the last couple of years have displayed grit—a word notorious for its usage in American football, but appropriate here I think. Marcelo Sarvas and his team-mate/Brazilian countrymen Juninho efficiently rock ‘n roll in the midfield, and have become what some people refer to as the Galaxy engine room, forcing turnovers and providing quick and smart passes outlets to the wings and up the pitch to create quick opportunities. Adding the Bosnian-American Husidić to that depth is nothing but a good thing at this point for a club that has youth but not much veteran depth. What did you say about veteran depth?!? Well, let’s talk Rob Friend! Friend, a Canadian international with 32 caps to his name, is coming to Hollywood fresh off his loan to 2. Bundesliga club 1860 München, where he put home five goals in 24 matches over the past season and change. It is currently unknown where Friend will fit in, though it will most likely be as a rotating element up front. With Donovan stationed on the left and Gyasi Zardes down the right, the Galaxy will look to Friend to help provide quality depth in the 18, and he may also see legitimate chances to start. The unknown quantity here is Samuel, yes, ANOTHER undiscovered Brazilian talent found by the scouting staff down in South America. I would imagine that Samuel could be exactly the “right” partnership that Keane needs up top. Fast and versatile. Someone who can drop back into space as well as find the open pockets of space behind the defense that Robbie Keane creates. And, oh yeah!, Robbie Keane returns for yet another season? Oh, what’s that? You can’t wait until the end of the year when his contract’s up? Well, tough luck. The runner up for 2013 MLS MVP just signed a two-year extension that will essentially guarantee that he’ll still have a Galaxy crest on his chest when eating those senior citizen dinners at Denny’s before suiting up on to make your club look stupid. As someone who loves his deep Irish lineage, I get a bit embarrassed at the thought of Robbie Keane being pretty much the most iconic player from my homeland. Still, I’m unabashedly proud at the incredible things that he does and how he backs up the intense ferocity on the pitch. His 0.64 goals per game since arriving in MLS two years ago is actually the highest goal scoring rate in the league over that period, just edging out Chris Wondolowski at 0.62 goals per game. Our Expected Goals 2.0 data also suggests that Keane scored more than twice as many goals as one would expect from an average player taking the same shots he took. That’s good for second in MLS among players with at least 50 shots. While LA might have taken a slight step back at different points over the last few years, and while they quietly were put down against RSL in the playoffs last November, it’s safe to say that Bruce Arena has yet to lose his Midas Touch. The Galaxy are going to be a dominant force next year, one might actually consider LA a quiet contender for the MLS cup. With the flashiness of Seattle, the pop turn of Portland, as well as Kansas City’s defensive dominance and New York’s offensive juggernaut, L.A. might be playing from the shadows a bit more than usual this season. It would still be surprising for them to finish anywhere outside the top-3 in the Western Conference, and inconceivable for them not to make the playoffs. This is a year that should continue their Yankees-like reign over silverware, and the dominance they’ve displayed over their three decades of existence will be on full display. A plurality of ASA readers picked the Galaxy to finish second in the West this season (134 of 406 votes; 33%), and an overwhelming majority believe they will make the playoffs in some capacity (384 votes; 94.5%). *Drew can teach you how to say “Superclub” at minute mark 15:58. This past off-season we’ve put a lot of time into the project of obtaining shot data from the 2013 season. We’ve mentioned this before, and I’m sure you keep coming back waiting and expecting it to be here. We hope to release that soon. We are closing in on completing the data set, and once done, the data will be used to create goalkeeping ratings, game states analysis, and many other things that I haven’t yet really mentioned. We (read: Matthias) are all extremely anxious to get started. But while we are winding down that project and getting ready for the regular season of MLS—and don’t forget NASL—we have a pre-season exercise that we would like to conduct this month. This will be a brief and simple survey that tells us how you think each respective conference will finish after the regular season. This endeavor almost certainly won’t lead to a perfect prediction of the final standings, but hey, maybe it will be close? The intended use is to give a short snapshot of how we all view teams at this stage of the season. Recent outcomes seem to distort perceived notions and ideas that we originally had about something to the point that we’re not sure what we thought prior to the occurrence of that specific event. It would seem our doubt is closely followed and probably facilitated by people claiming that it “wasn’t a surprise that Montreal jumped out to an early lead in the East” or that “you shouldn’t have been shocked to see D.C. United in the cellar.” After something occurs, it’s easy to feel like things were once forgone conclusions, even if beforehand it would have been hard to rationalize a one-dollar bet on that outcome. Most of the time it’s just an arrogant (and probably ignorant, too) pundit that would choose to speak for the entirety of those that enjoy and follow U.S.-based soccer. But, let me ask you, would you have guessed that the Timbers were going to be the #1 team in the West last year? A team that, despite it’s dedicated following, looked miserable just one season ago. Who would have guessed that LA was nearly a wild card team? Think about the fact that Landon Donovan, who rightfully had been restored to the US Mens National Team roster, was in his best form in years and the Galaxy barely missed the single elimination match to get into the playoffs. There is no doubt in my mind that Philadelphia Union supporters, the Sons of Ben and Co., believe that they will be a top-3 club in the East. Yet, judging from the incredibly small sample size of the survey I’ve sent out, most don’t believe they’re a playoffs team at this point, and some even believe they are the worst team in the East. I admit that these votes were cast before the announcement of key additions Maurice Edu and Vincent Nogueira, both of whom are primed to make sizable contributions to their new club. But that underlines that fact that maybe we missed something. Maybe there are things that with overlooked in this fast and furious off-season. This is your opportunity to influence things and make your voice heard. With most major European transfer windows closing this past weekend, the waters of MLS will settle and the rosters will start to set. It doesn’t eliminate the possibility of an impact talent still signing with the league; there are interesting players in leagues that still have windows open. Regardless, we are starting to gain an idea of the starting line-ups that in turn help us reference the order in which we could see clubs finish, and this gives us our best chance at making an intelligent and informed decision. The link to the survey is below and will be available from now until the 21st of February. We have a very optimistic level of participation that we’d like to see which means that we’re going to need some help to meet those obscured and honestly, pretty randomly chosen goals. This is the part where we selfishly push this on you as “the only way we can do this.” It’s an old—and maybe a bit contrived—tactic, sure. But the truth is that while we could be satisfied with the anywhere between 100 and as many as 250 unique and steadfast visitors that we have to this site, we won’t be. We need more help. I’ll assume you have friends or people that would pass-off as such—Google calls them “acquaintances.” I’d also suspect that you have a new-fangled social media option which you prefer. All I would simply ask is that you take this survey and then share it with others. Whether you love your Twitter like a new-born baby, or shun it as you should Eddie Johnson, tweet this baby out. The more voices that we hear, the better the picture becomes, and the less probable it is that some idiot just comes and nukes your favorite team just because he’s a supporter from an opposing club. *Please bare in mind you only get one vote. Just one. Use it wisely. This was suppose to be a quick 15-to-20-minute podcast that turned into an almost 52-minute single segment ramble about all things US in the past week. It was just Drew and I, covering just about everything conceivable over the course of the loss to Costa Rica on the road to the win in Columbus against Mexico. No spoilers; just have a listen. Matthias to Drew by text after CR’s third goal: [The defender definitely got beat, but the Costa Rican player didn’t even get to the ball until it was 23 yards out. That’s Howard’s ball. In a private interview with the Matthias, the editor was assured that Matthias never thought the goals were 100% Howard’s fault, as Matthias—a student of probability—rarely believes anything is 100%. Oh, and Drew is a poophead. Matthias edited is the editor of the site, just in case you didn’t realize that.